AMPLIFYit is owned and operated by Bryan Charbonneau, who has over 20 years of illustration and graphic design experience and a wealth of custom decoration and embroidery knowledge. 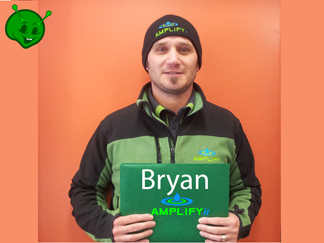 Bryan and the AMPLIFYit team can take your project from beginning to end, from designing your logo, to creating a custom sew file, to sewing the completed product. "We pride ourselves on the ability to offer a complete package, swiftly moving from design to full production. This is how we achieve timely affordable services for our clients." 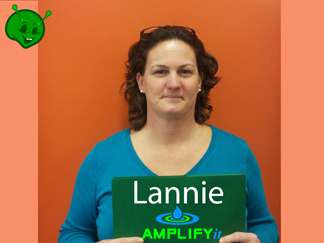 AMPLIFYit’s comprehensive in-house services include: Graphic Design, Digitizing, (making your logo into a sew file) Embroidery, Hot pressed vinyl decoration for garments, trophies, laser etching on metal or glass, laser burning on wood and vehicle decals. Other services include silkscreening, banners, signage and Promotional Products to vast to list. They work with every budget and brand and there’s no creative project they aren't willing to tackle, give them a try! Bryan is the owner and artistic director. He has over 20 years experience in illustration and has been running Amplify it since 2012. Lannie is our machine operator, production manager, and also known as the "Boss". There's not much she hasn't seen in her 12 years of embroidering.